Carolina Comments began in 1952 as a newsletter of the North Carolina Department of Archives and History. 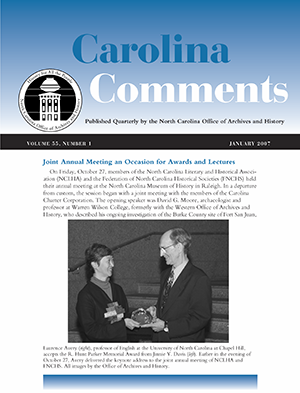 The newsletter reported on historical activities in the department and around the state and served as an organ of the North Carolina Literary and Historical Association. Much of the information that had been appearing in the "Historical News" section of the North Carolina Historical Review was absorbed by Carolina Comments. In the late 1970s the newsletter took on a more structured format, with regular reports from each section in the Division of Archives and History; news from state, county, and local historical organizations as well as colleges and universities; feature stories; and occasional articles. It continues to be published six times a year (January, March, May, July, September, and November). 2013: Carolina Comments became a quarterly publication in 2003. North Carolina Office of Archives and History. Carolina Comments. 2002-present. http://www.ncpublications.com/comments/archives.htm. North Carolina Office of Archives and History. Carolina Comments. 2002-2012. http://digital.ncdcr.gov/u?/p249901coll22,489327. Corbitt, D. L. "Division of Publications: Carolina Comments." Twenty-Fourth Biennial Report of the North Carolina Department of Archives and History. Raleigh, N.C.: Department of Archives and History. 1952. p.49. http://digital.ncdcr.gov/u?/p249901coll22,34521 (accessed August 28, 2012). The January 2007 issue of Carolina Comments. Image from the North Carolina Digital Collections. http://digital.ncdcr.gov/u?/p249901coll22,169107 (accessed August 28, 2012). 1 January 2006 | Crow, Jeffrey J.